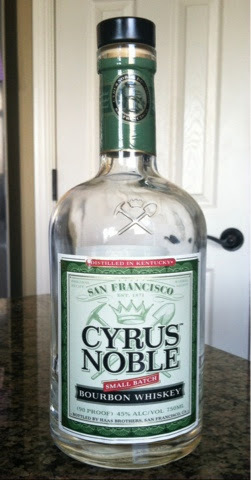 This Bourbon (not a Kentucky Bourbon as it was distilled in Kentucky but aged in San Francisco) was also recommended to me by the walking bourbon encyclopedia that recommended a bottle of Eagle Rare 10 yr.
Cyrus Noble comes in at 90 proof, though your tongue would never betray it. It is a smooth whiskey, from start to finish with minimal burn, and it offers a brown-sugary sweetness that lingers from the nose to the finish. It's not an overpowering sweet, though, and the cinnamon and nut flavors still come through right at the start and stick with each sip through to the finish. It also had a subtle spiciness that you almost don't notice upon the first sip, and only really know it's there in the finish. All in all, I found myself making my way through this bottle relatively quickly. While I did not find myself yearning for the next glass as soon as the first was finished, I certainly found myself eagerly awaiting that time when the kids were in bed and I could sit back on my couch and enjoy a glass. Overall I was very pleased with Mr. Noble and his bourbon. It did not knock my socks off, but it is a completely inoffensive and tasty bourbon. I'm sure he and I will meet again one day.